Is better communication on your agenda? 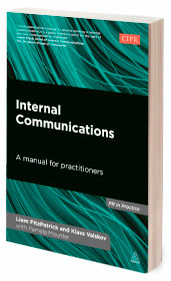 As part of the CIPR PR in Practice series, Kogan Page have published our book exploring the basics of internal communication. With the former Communications Director of Maersk Line, Klavs Valskov, we’ve written a book that lays out the fundamentals of internal communication; it’s really not too complicated. How to develop yourself and the team. Contact us to hear more about our thinking and how we can help you implement it in your organisation.